Having been a part of the Warhammer community since I was 12, I always admired the great display boards and ‘Eavy Metal entries I found in White Dwarf each month. They’re what I looked up to as an example of what was to be considered the “best” painted and modeled armies. Naturally, life got in the way with college, marriage, a new baby, grad school – so I never really had time to set aside to push myself to try something like this. 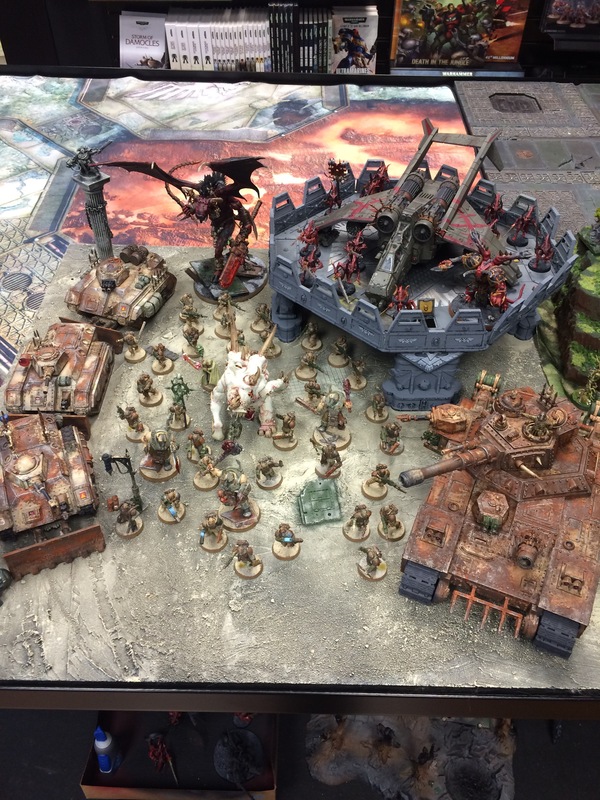 Years would go by where I would see Armies on Parade entries and think to myself, “Hey, I could do that.” I never tried; I simply never had the time. I remember thinking how sweet this army looked. Back when the Old World was one big well manicured golf course! I decided to use my Renegades and Heretics from Imperial Armour: 13 as my entry. I had been slowly building and collecting them since my daughter was born, making limited progress during a baby’s naptime when I was able. It was slow going, but I really enjoyed the army’s Nurgle theme. It also allowed me to play with a “human” army, which I tend to always have at least one of, albeit one tainted by chaos! It would allow me some interesting conversions, and enough flexibility with my painting to do it loose and fast befitting of a Nurgle force happy to be in a state of decay. 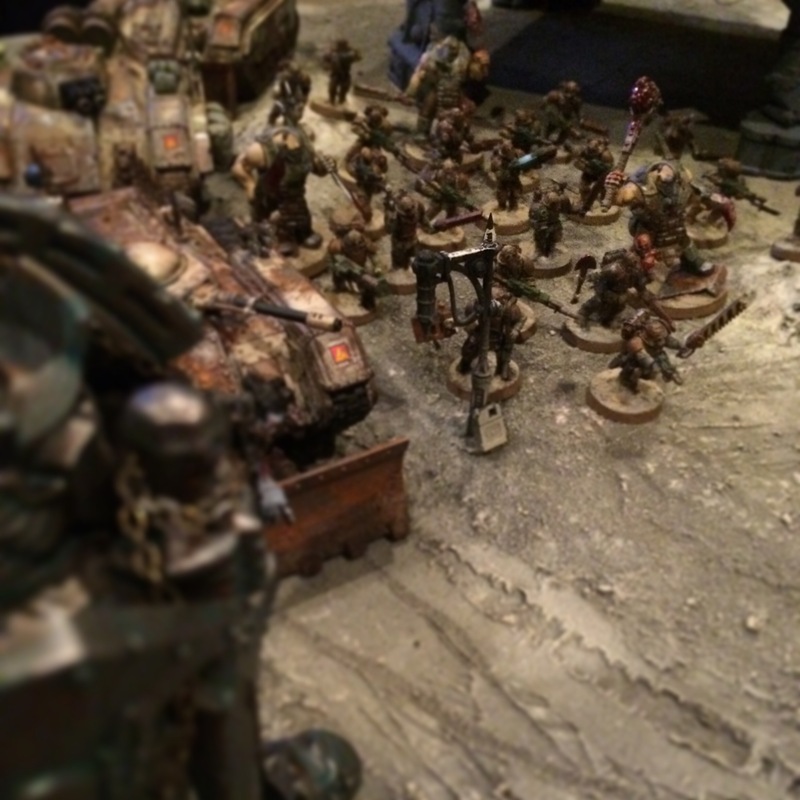 A shot of the infantry and Chimeras advancing down the road – Skyshield is in the background. Long story short (as this isn’t a step-by-step on how I built the board or painted the minis), I textured a board, added some topography, painted it up in basic neutral colors, and affixed a Skyshield Landing Pad (with LEDs! ), some statues in various states of corruption, and placed my painted forces on it. At the time of entry, I had only 35 infantry painted, a Baneblade, three Chimeras, three renegade Ogryn, a Valkyrie (With LED lights! ), a very basic paintjob on a psyker, and Greater Spawn. After placing them on the board, I really thought it needed more height, so added my Bloodthirster conversion from a few years ago to the back, and threw my Bloodletters up around the Valkyrie, a scary prospect! 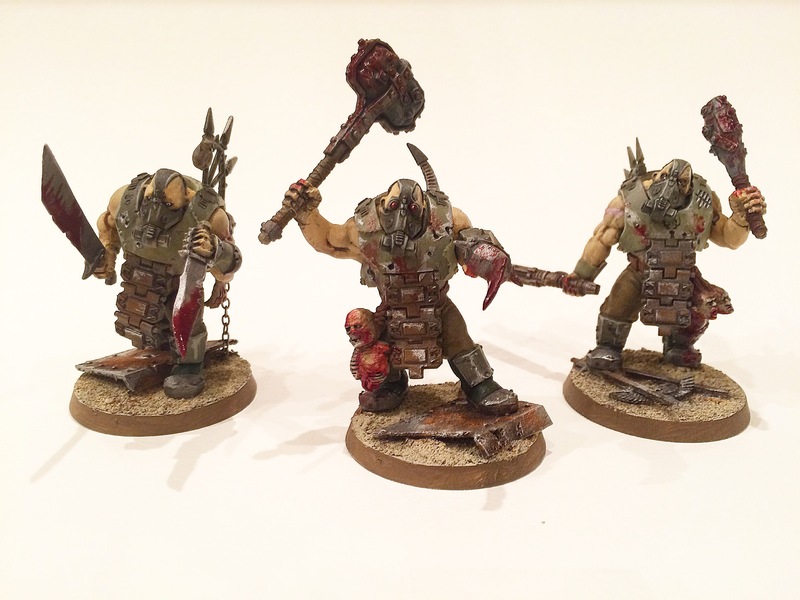 So in the end this Renegades and Heretics army is undivided in that it has both Nurgle and Khorne forces – though realistically I’ll likely play them as mono-Nurgle. Not a great photo, but you can see the layout from here. Hindsight is 20/20, there’s a million things I’d change, looking at it now. All of this being said, I was pleased with my first AoP entry. It wasn’t my best work, but given my present life situation with work, grad school, and family management, I couldn’t have been happier to have gotten something decent together. That all changed when I arrived at Games Workshop: Riverbend. The competition was insanely good. 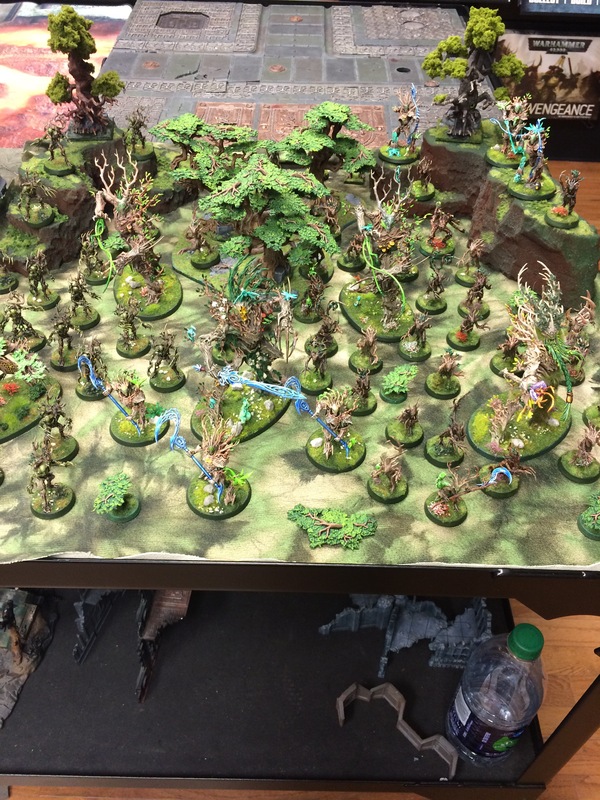 There was an Age of Sigmar board that was meticulously crafted, Sylvaneth treemen in a sea of greenery, hidden details, the works – something you’d expect to see featured in White Dwarf. A particularly striking board was a seaside cliff, with expertly crafted water, waves, and sea foam crashing against it. The Space Marines on top were a homebrew 2nd Founding of the Iron Hands, the Sons of Triton – and they were stellar. Not only did he have a quality force with hand-painted original iconography, he had a compelling backstory and fluff (which I think makes an army!). I knew I came ill prepared for this kind of competition. Kicking myself because my background in Studio Art certainly allows me the opportunity to create something phenomenal, I was frustrated at this point because I simply didn’t have the time to complete with entries of this caliber; why did I enter this year, again? I should have waited to really make something great. But now wasn’t the time for excuses, I was committed! The Sons of Triton are in it to win it! I believe there were fifteen entries submitted that day, and I would say 8-10 of them were outstanding. Even the remaining “worse” ones were fantastic, only lacking a finished board, or a few details absent – not unimpressive by any means. I resigned myself to an Honorable Mention slot, and spent the next hour talking with a friend who had showed up and making some purchases I hoped to complete while I was there. The voting began soon after, and I was anxious the whole time. Trepidation was apparent on everyone’s faces as they scanned the room during the voting process, trying to gauge interest among those present. It was, after all, a popular vote by anyone in the store at 5pm. 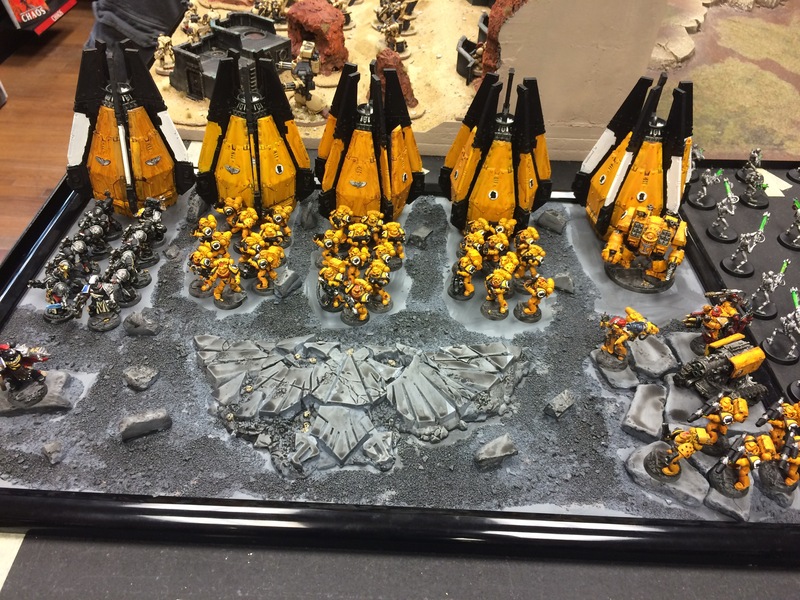 Having recently started an Imperial Fists army, I liked seeing the bold yellow here on display! Matt, the store manager, got everyone’s attention and mentioned the level of quality work present, and how close some of the tallies were. He began by saying a few boards made Honorable Mention, and I hoped I’d qualify for one of these positions. He listed two boards, one was a very impressive Tyranid army, and the other was the Sons of Triton! The freaking Sons of Triton, with their wonderful display, got an honorable mention. My heart sank. I forced a smile, genuinely happy for the Triton entry, he earned it, and congratulated him and the other mention. Matt then proceeded to say that the third place winner was very close with the second, only decided by a margin of a few votes. Third place was awarded to the 177th Stygian Cataphracts, my Renegade Guard! I was floored, and a little relieved – though I did feel a little bad for the Sons of Triton, as their entry was very well crafted. The voters apparently liked my conversion work and display board enough to edge me out over the competition! 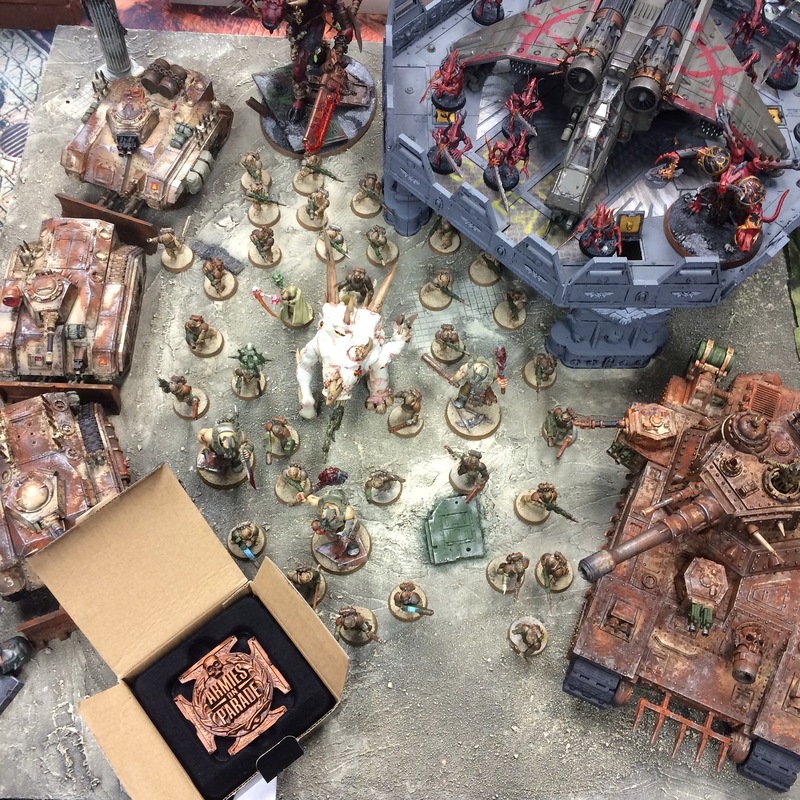 So I got my little bronze medal, and a lapel pin, and knew I’d leave with what I came to get – a placement in the official Armies on Parade! 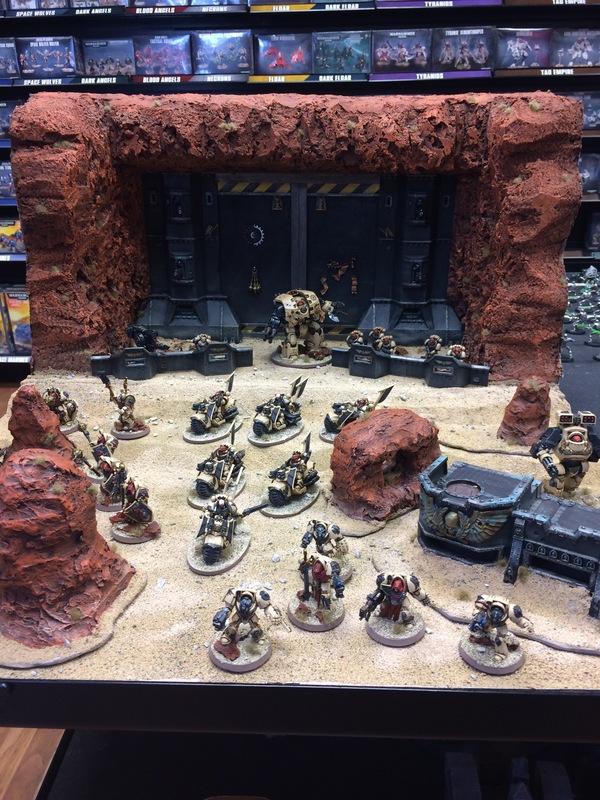 A very “Armies on Parade” type of entry you’d expect to see – very well done Dark Angels successors! P.S. 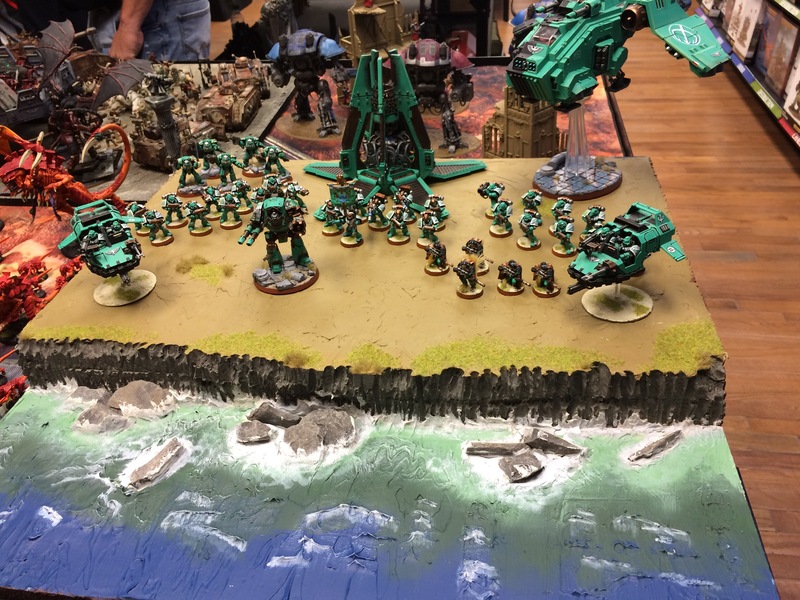 The Sylvaneth board won first prize, and a Dark Angels successor chapter won second. Both were fantastic entries, and I couldn’t be more humbled to have been considered among so many quality entrants. It was a great time, and I can’t wait for next year where I’ll shoot for silver! Never been happier to have gotten 3rd place! Watching this board come together via Instagram was awesome! I know just how much you put into each piece, it’s unbelievable how hard it is to make things look “decayed” in a natural way. The ogrins you made were so cool, they really look like servants of the Blood Gods! I think you won 3rd because you chose to use a very tricky army theme, forces of good gone evil. That takes a great deal of thought and conversion to pull off! I think you deserved no less than third! Your army doesn’t just blend together, each model has its own unique way to stand out, unlike a space marine army. The lack of uniformity really captures the element of Chaos. I’m glad to be a small part of your hobby and am inspired by the work you do. Thanks, great work! Looking forward to the Imperial Fists! Thanks man! That means a lot, I really had fun doing it, and I look forward to finishing my renegades. I still have a lot of guardsmen to paint, and about six tanks to finish as well! But now that Armies on Parade is over, I can take my time to some of the more special characters. Well, armies on parade is about the armies (how the miniatures are painted and their tematic), but it is not about a diorama. That’d be dioramas on parade 😛 So I guess your minis were better painted than the Sons of Triton, independently of the board were they are displayed. Nice entry by the way! Congrats! I actually need to disagree there! Everything I have read leading up to this indicated that it was a “whole” presentation that would be judged on theme, selection of units, display, etc. I would absolutely say that my minis weren’t painted better than some entries, but the whole display mitigated that, I think. Golden Daemon would therefore be the purely painting contest. Thanks either way – suuuuper humbled to have even entered, much less placed!